Everyone in the film industry is aware of the love story between Genelia D’Souza and Riteish Deshmukh. The couple is making sure that they always rejuvenate their love by doing something special for each other. The ‘Masti’ actor sent a telegram to his wife on the day the 160-year-old service came to an end. Genelia posted on Twitter, “Received my 1st telegram on the last day of its service from my Navra. Thank u Riteish #happy me”. The term ‘Navra’ in Marathi means husband. The ‘Tujhe Meri Kasam’ actress even posted a picture of the telegram which was sent by her husband. The telegram service was shut down by the postal department of India on July 15, 2013. Genelia and Riteish were rumored to be in a relationship since they starred together in a debut movie ‘Tujhe Meri Kasam’ in 2003. For a long time, the couple did not reveal anything about their relationship and let the media and fans predict and gossip about them being together. It was only in 2012 that the couple got married in Mumbai. The two stars have worked together in other Bollywood movies, like ‘Tere Naal Love Hogaya’ and ‘Masti’. 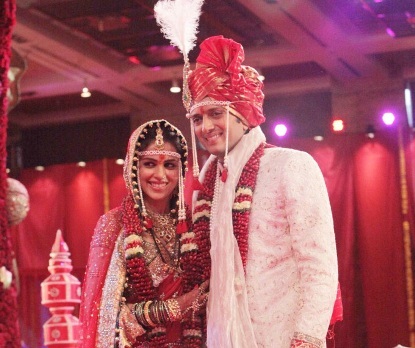 Riteish and Genelia got marries according to Marathi, as well as Christian traditions.